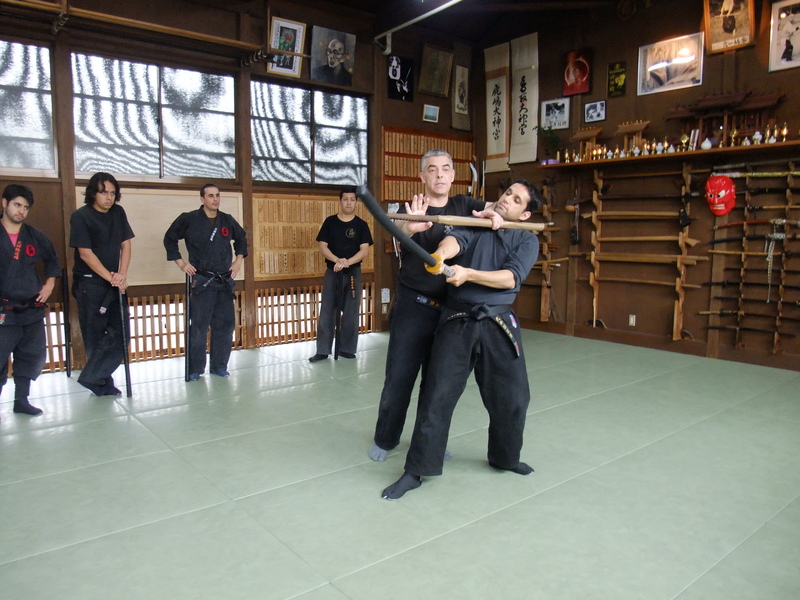 Today I gave a class on biken jutsu at the honbu and we studied the kukishin sword. The two hours passed so fast that we didn’t have time for a break as we use to have here in mid class. It was nice to dwell gain into the waza of the school as we mainly apply the kankaku of the various schools into our classes with sensei and the shihan. This is what sensei explained to me over lunch last Sunday. Since we entered the world of Juppô sesshô in 2003, everything we do now is based upon the taijutsu with weapons using the “flavor” of each style and mixing them together. what we study now during class with Sôke is not anymore the waza but something we can call 風味の技 (fûmi no waza), a flavored technique. Last year for example we did a lot of sword techniques with the fûmi of Shinden Fudô ryû. But beginners need to have a from to start from and the kukishin biken jutsu (and the togakure biken jutsu) are there to give them that. So it was nice to review the techniques again. Each one of these basic techniques is then completed by a set of 9 sayû* gyaku; and a set of 9 henka. Which makes a theoretical total of 27. What I understood last year in April when training with sensei is that we can see the sayû gyaku (左右逆 – left right reversing forms) as how to apply the basic form to the left or to the right of the opponent. Each sayû gyaku contains in fact more than one or two forms. Then the henka (変化 – beginning of change/end of change) is how to apply the basic form while moving forward or backward. Here again you have more than two ways of doing each one of them. So from the 9 basic forms listed above with the added sets of sayû gyaku and of henka, we get an infinity of possibilities to adjust the technique to the fighting conditions. Maybe this is the reason why Toda sensei told Takamatsu going to challenge Ishitani, sôke of the kukishin: “don’t use sword techniques against Ishitani sensei as his kukishin biken jutsu is much more powerful than our togakure happô biken”. The reason why I separated the basic forms into three sets is that if you study these techniques carefully you will notice that they do not apply on the same timeline. The first set is used when you react after the attack begins (nijigen no sekai); the second set while the attack begins (sanjigen no sekai); and the third one before the attack begins (yûgen no sekai). Also in each group you will see that the first technique of each group is a ten (going up); the second one a chi (going down); and the third one, a jin (going to the opponent). These groups (tenchijin and up/down/forward) actually define a matrix of actions that can be adapted through the sayû gyaku set and/or the henka set. Maybe this is what sensei meant also by naming it “kukishin ryû happô biken”. *note: sayû is the Chinese pronunciation of hidari migi.